Telebras (B3/Bovespa: TELB3 & TELB4), a Brazilian state-controlled public telecommunications company, and Viasat Inc. (NASDAQ: VSAT), a global communications company, now have a strategic agreement to bring high-speed, affordable internet to unserved and underserved communities, health clinics, schools and hospitals across all of Brazil. The collaboration will help fulfill the Brazilian Government’s National Broadband Program (or Programa Nacional de Banda Larga, known as “PNBL”), which is focused on promoting social and economic development in the country by ensuring fast, affordable broadband connectivity to all Brazilians. The collaboration will combine the Ka-band capacity of the Telebras-owned and controlled satellite, the SGDC-1 (Geostationary Satellite for Defense and Strategic Communications), with Viasat’s proven ground network and infrastructure, and Viasat’s unique ability to bring affordable and scalable broadband services to communities where internet service has historically been unavailable. 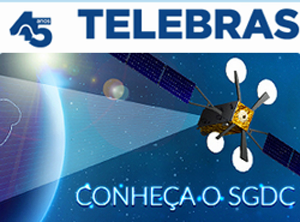 Telebras launched the SGDC-1 satellite — the only Ka-band satellite to offer nationwide high-capacity broadband coverage across 100 percent of Brazil’s territory, including coastal areas — in May of 2017. By working with Viasat, Telebras can take advantage of Viasat’s innovative ground infrastructure to enable the commercial viability of the SGDC-1 satellite, and begin connecting the unconnected across the country. Once the SGDC-1 network is operational, Telebras can meet its obligations to provide internet services to Brazil’s citizens under the Brazilian Internet For All public policy as well as key national government entities, including schools, hospitals and other government institutions under the Brazilian e-government initiative known as Governo Electronico – Serviço de Atendimento ao Cidadão (GESAC). In addition, under the terms of the agreement, Viasat will leverage the SGDC-1 satellite network to explore satellite services for enterprise and commercial aviation markets as well as launch satellite-enabled WiFi hotspot and residential services into communities across Brazil that lack high-quality, affordable internet services. Viasat has successfully operated 14 million hotspots across 30 countries and today has deployed affordable, satellite-enabled, WiFi services covering hundreds of thousands of residents in multiple communities across rural Mexico, where internet service was previously unavailable. Specific terms of the agreement have not been made public; however, the arrangement is founded on a success-based revenue-share model, in which Telebras expects newly-enabled market opportunities to potentially generate more than USD$1 billion in revenues for the company over the next 10 years. Maximiliano Martinhão, Telebras’ president, stated that the company's agreement with Viasat enables us to establish the necessary infrastructure to bring wide-reaching, reliable, high-speed data communications to Brazilians – even in the farthest-to-reach, less populated regions of the country. Together with Viasat, the company can help meet Telebras’ mission in public policies: to bring affordable internet to all, while building Brazil’s competitive global future through job creation, skillset development and by reducing the sociology-economic disparities created by a lack of internet access across the region. To put it simply, this agreement means confidence in the recovery of Brazil’s economy and Telebras’ ability to achieve its objectives.